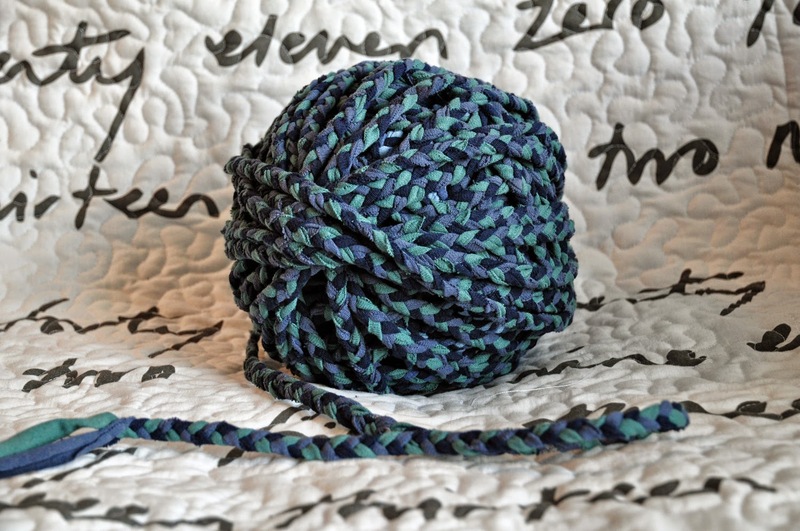 The 'Hexenkissen' (Witches Pillow) is a very clever little pillow, far easier to make than it actually looks. It is a bit fiddle, but mostly because one is working with a million narrow stripes, but the end product is well worth it. 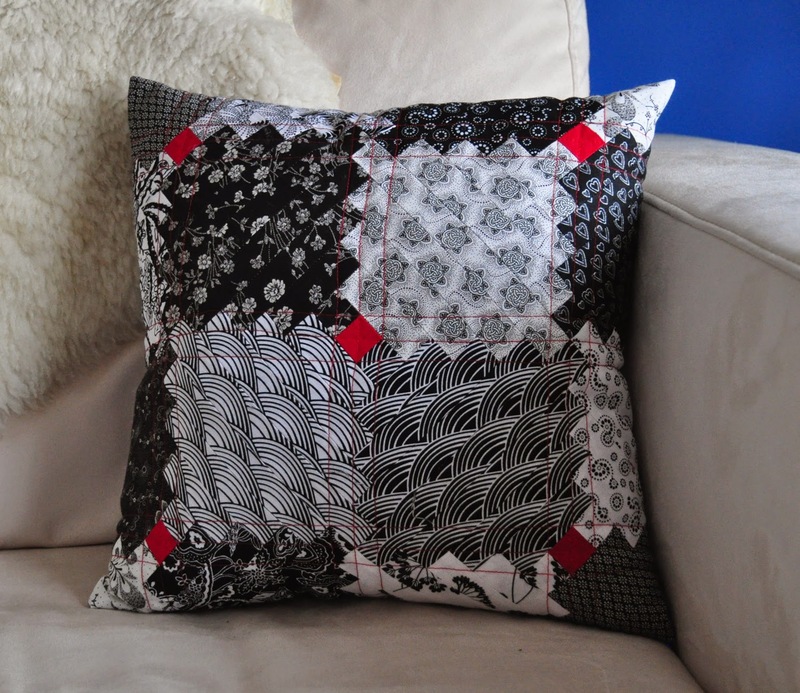 It uses 18 different black and white fabrics (ready cut into a narrow jelly roll with 1 1/4 stripe width) plus a tiny bit of red fabric from my stash. 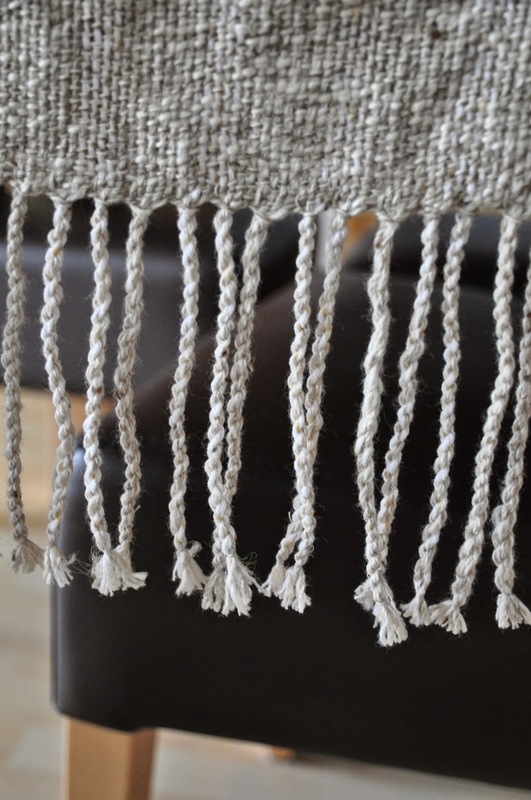 Last weekend's weaving project turned into a plain table runner. It's all I hoped it to be. I thought about adding a stencil print to it but my friends voted against it. The hardest bit has been the tassles, which took almost as long as the actual weaving, but well worth it. 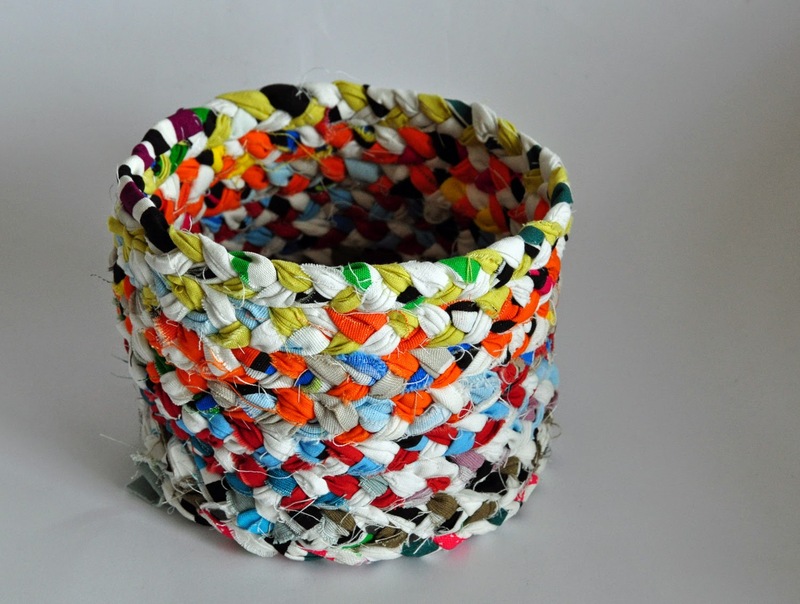 The fabric cord I made two weeks ago, now has turned into a smallish basket. My first attempt on the sewing machine ended into a rather crooked and strangely shaped object, so I took most of it apart again and sewed up the side walls by hand. The whole thing is still not perfectly straight, but much better than before. After I took the picture, I also added a blue lining to the inside. 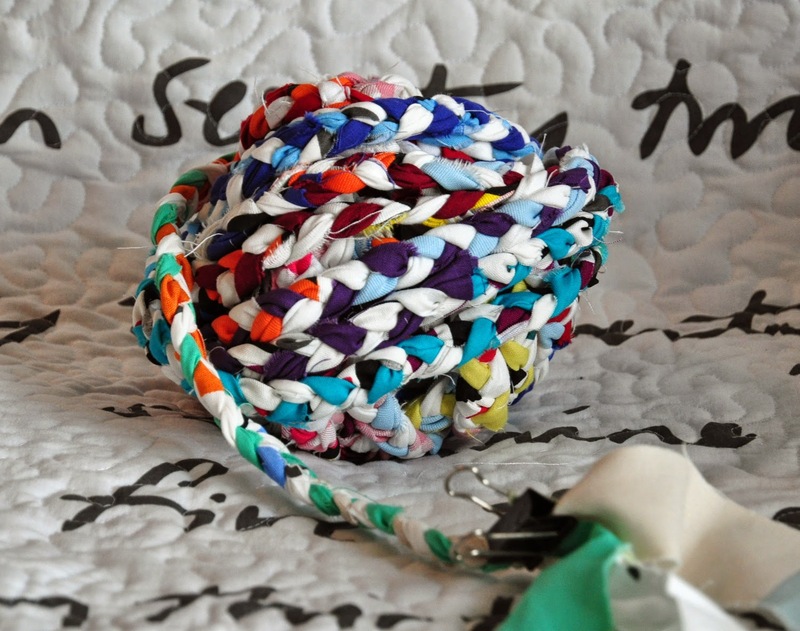 I still have quite a bit of cord left over and I'm thinking about braiding more and give the bathroom rug a second chance. Some day, when I should find time. 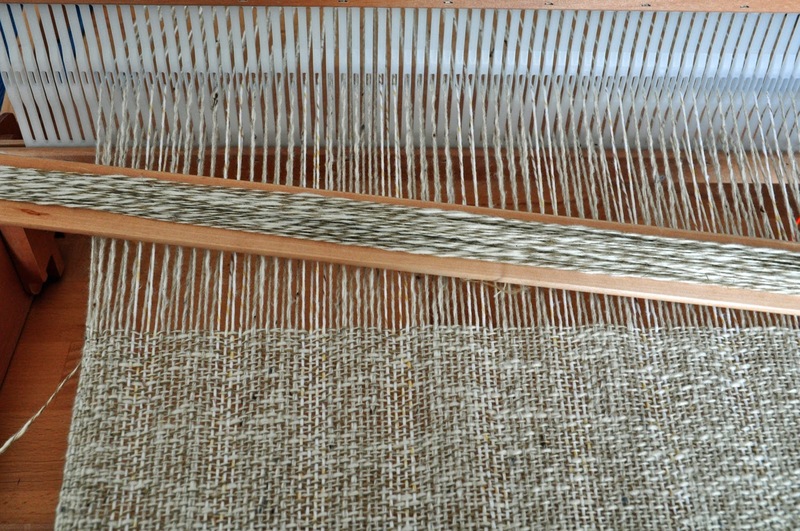 Other than knitting socks once again (which I hope to show next time), I also pulled out my loom once again. 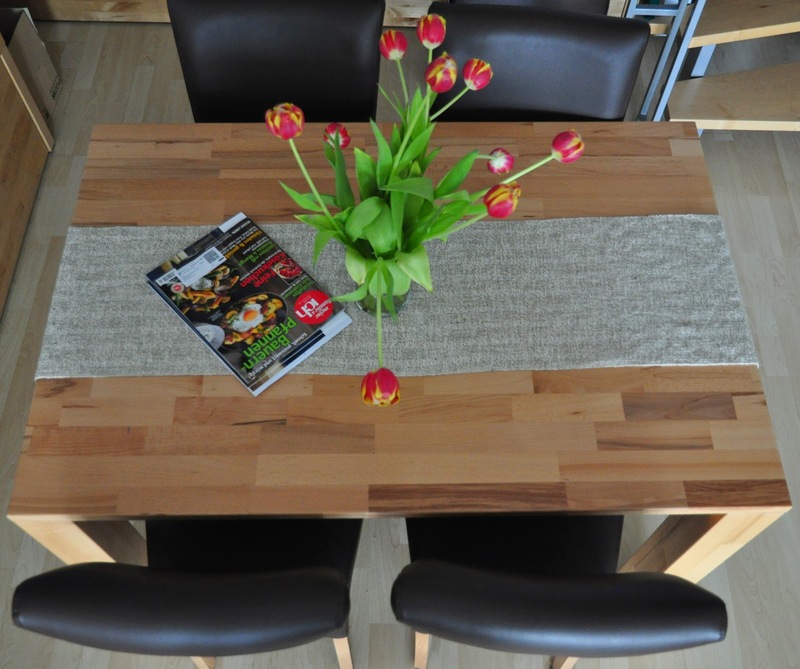 I have decided I need a long table runner for my dining room table. The weaving part is acutally done now, and I'm working on making nice tassles. This quilt was a bit long in the making. Started last May it sat there waiting to be quilted for a good six month. Part of it was that I was busy with other things, another part was that the actual quilting part is not my favorite part of the whole process. 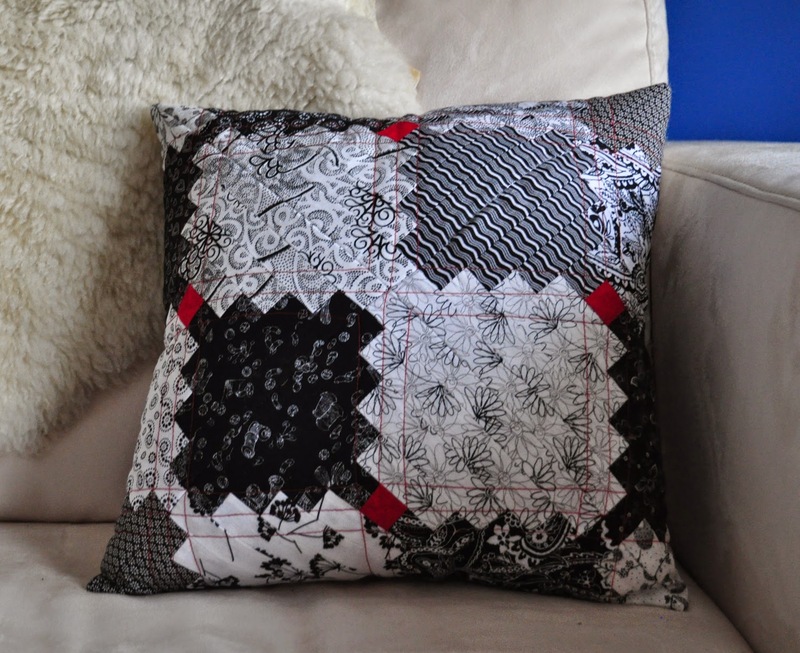 I have used mostly scraps for this quilt (and a few meters of white fabric). In the center bit I started with 5'' and 2'' squares, which I first sewed to half square triangles and then added another triangle into one corner. I then made light diamands (with the colors at the edges and the center) and dark diamonds. There are 6 x 7 blocks, framed by a narrow white border and then a colored border using more scraps. Final size is 170 x 150. For the backside I used some more scraps, which I stacked to a long stripe, which went between the main fabric. I never seem to be able to join the back and the front perfectly straight, but well, nobody is perfect. For the quilting I stipled all over the center and the outer edge, and some wavy lines for the white border. Finally, the binding is black (as the most neutral color I could think of) with white fake piping. The instructions said to sew the front on using the sewing machine, but that turned out very untidy, so I did unpick and re-sewed by hand. I'm super happy with the finished quilt, and not only because this frees me now to start something new. Last time I cleaned out my wardrobe, I put several t-shirts aside I didn't like to wear anymore, but thought I could use for other things. 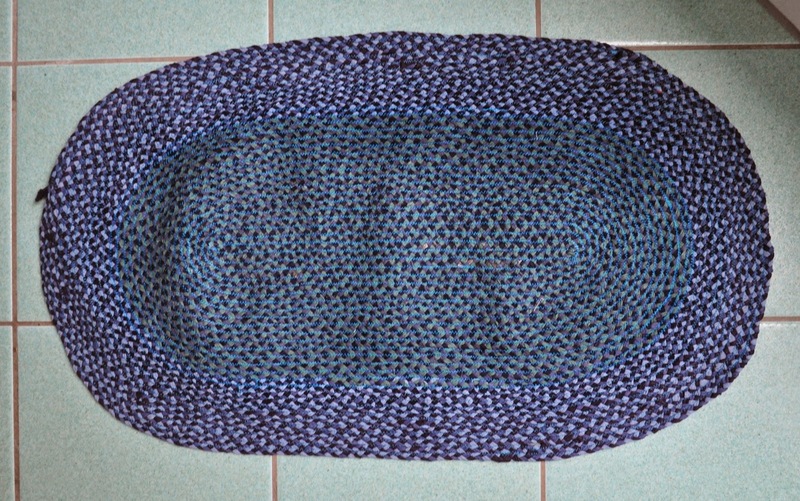 The other things, as it turned out, was a braided rug for my bathroom. The project started out with six t-shirts, which I cut into stripes. It took my up to t-shirt 3 to work out the best way to cut in order to get a long, continues stripe, but once I got it, it's really fast and easy. Next I braided three t-shirts at a time into a long, long cord (my guestimation is 60m all in all). This is nicely done in front of the tv or while listening to an audiobook. 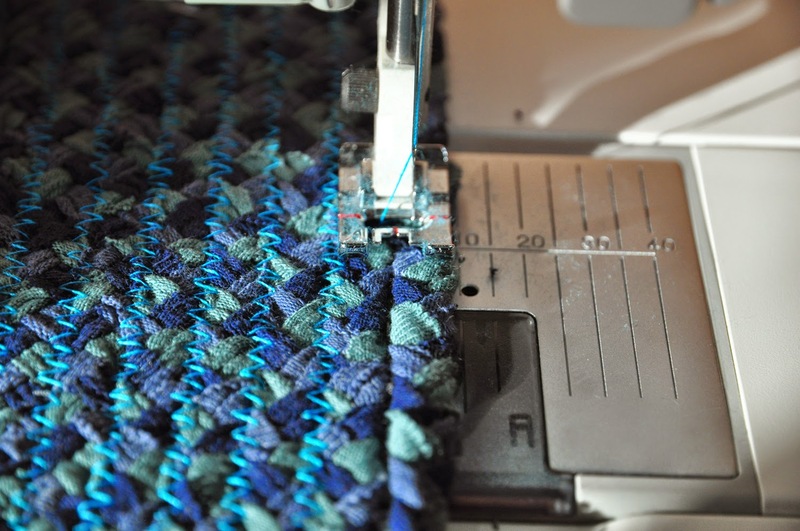 On the sewing machine I sewed the cord together using a wide zigzag stitch. This one finshed, I started with the next project, this time using some not so much loved cotton fabric I haven't thrown out yet. Doesn't that look like it could have a lovely little basket in it's future?